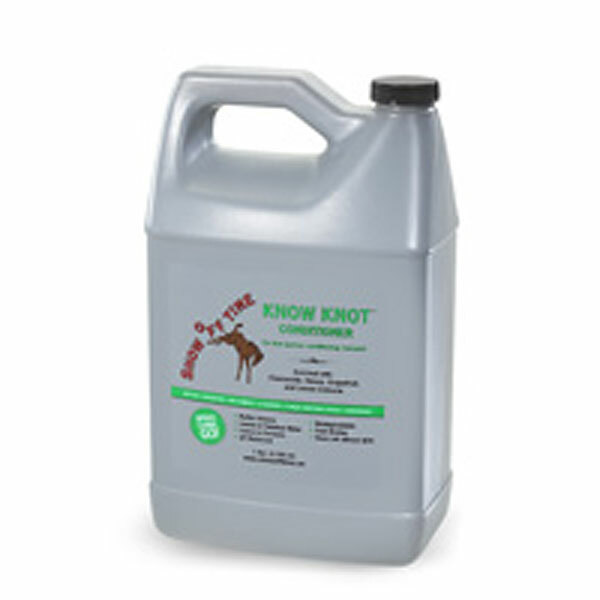 Know Knot really keeps my horse's mane and tail in great shape. Takes the tangles out with little effort on my part. Does not leave any build up in the hair. I have been using this for several years. I have used Know Knot for nearly five years. In order to keep my mare's mane, tail, and forelock as thick as possible I spray them daily with Know Knot and do finger combing only. About once a month or so I gently use a comb on her (I never use a brush) and hardly ever find a knot or a tangle. I love this product, plus everyone at the barn always comments on how good it smells. I love Know Knot. It's the best detangler ever. I wouldn't use anything else. I was introduced to this product by Cathy Ebsen who is our Executive Assistant. She used it on her show horses and encouraged me to try it on my herd of Colonial Spanish Mission Horses. I found it to be a superior product and have kept all my horse's manes and tails in excellent condition. I absolutely love this conditioner. I spray it on while the hair is wet and just let the hair dry before brushing it out. Silky soft every time. Love this product. I have been using Know-Knot for over a decade. It is easy to use and really works at getting the tangles out of my horses manes and tales. The Best! 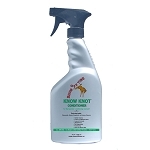 I LOVE Know Knot Conditioner ... not only for my horses, but for myself, my daughters and my granddaughter as well. It's an amazing product that leaves no residue, but I can spray on the largest knot in my horses tail or mane and I am able to work it right out. Does not make mane, tail or hair brittle, but soft and supple. This product is amazing . I have used this product for 5 yrs. and basically threw all the other products away. It's rich and lasts for days , even after rain and mud. Absolutely amazing stuff! Not only does it make our show horses coats look beautiful, they smell awesome too! This is our go-to product in the barn, we all love it. love this product. Gets the tangles out without leaving residue. I even use it on my grand children hair. Absolutely LOVE this conditioner! When I use it my friends all ask why my horses smell so good! I love the way it untangles my horses manes and tails without leaving sticky residue that collects more dirt and dust. My horses manes and tails flow and are beautiful for up to a month! I love this product. I have tried all sorts of different leave in conditioners and this one is the best. My horse has a long tail and this is a great conditioner.